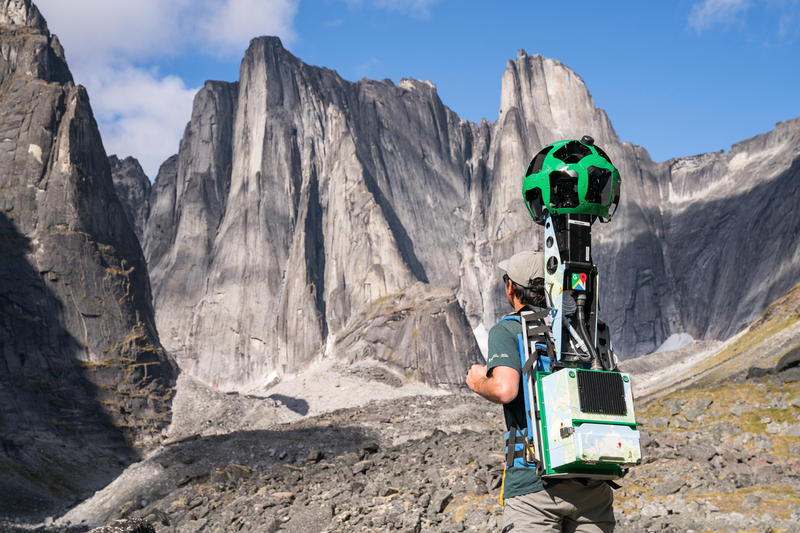 A Google Trekker at Tanquary Fiord in Quttinirpaaq National Park. Google Trekker at Níonep’eneɂ Tué at Nááts’ihch’oh National Park Reserve. 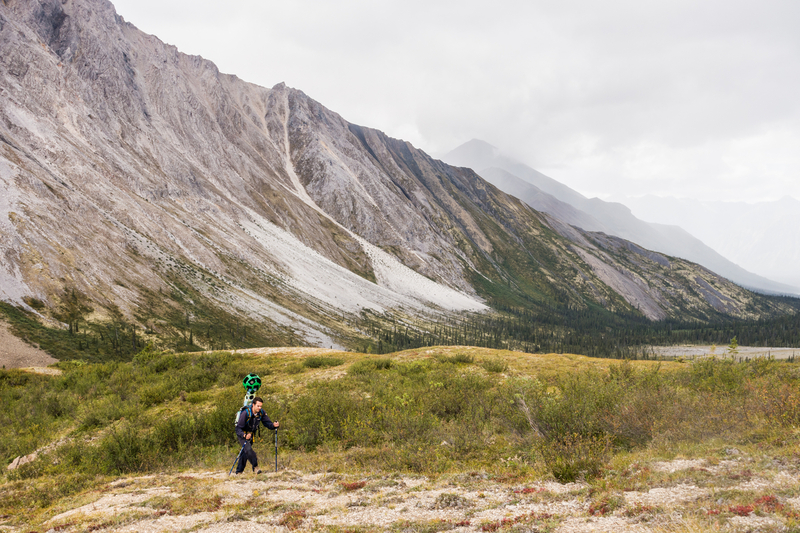 Google Trekker records data in the Cirque of Unclimbables at Nahanni National Park Reserve. 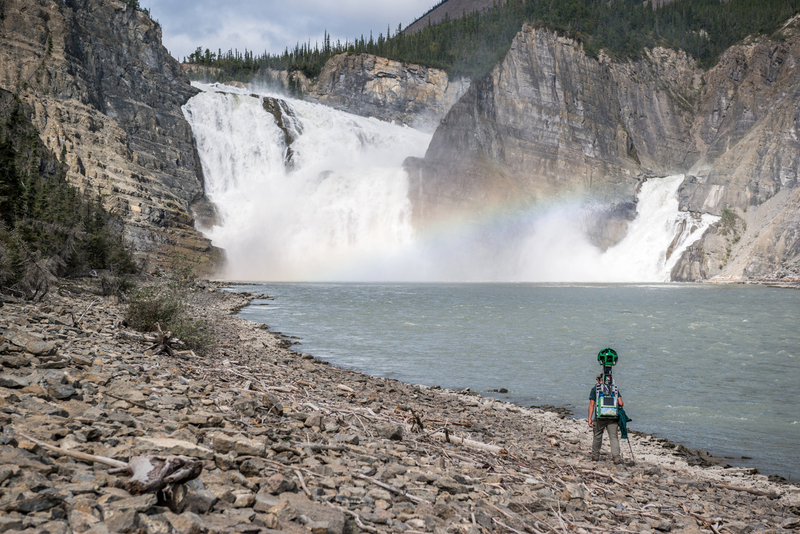 Google Trekker records data at Náįlįcho (Virginia Falls) at Nahanni National Park Reserve. You thought you had trouble getting to the office in the morning? Try getting to Quttinirpaaq (Koo-TIN-ir-pa-ack) National Park. 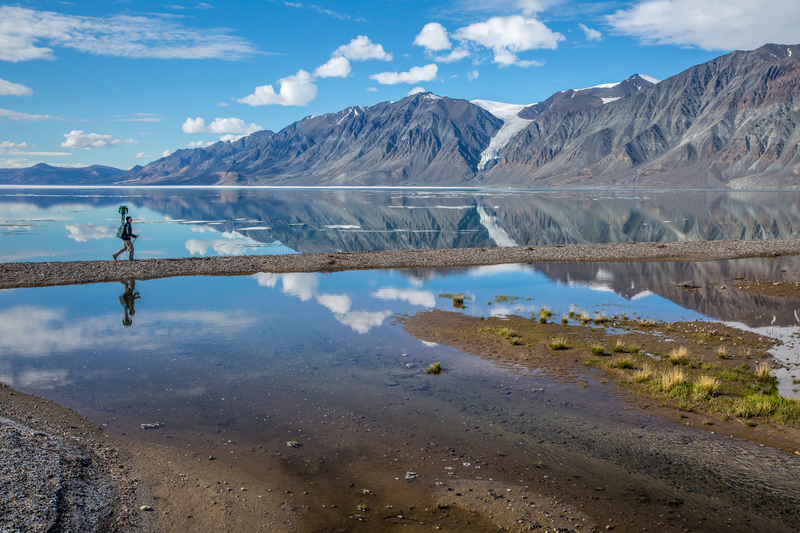 Located on the northern tip of Ellesmere Island about 800 kilometres from the North Pole, getting there takes several connecting flights, a fair bit of time, and no small amount of cash. Only two or three dozen determined adventurers manage to do it in any given year. For Google, the journey is a dramatic demonstration of its ever-evolving geo-mapping technology, as well as its aspiration to organize, arrange, catalogue, classify, and otherwise be in charge of the world’s digital info. The camera itself is a strange, 20-kilogram bug-eyed ball that can sit on top of a car, a Ski-Doo, or a backpack. Loaded with 15 cameras of five megapixels each, it snaps photos every two seconds; Google engineers then stitch together the images for a seamless visual experience akin to video. Let’s be honest: it’s also about pride. It is all too easy for city dwellers to forget that we are, as a nation, still roughing it in the bush. Through our art, our literature, even our pop music, we have been taught to revere the landscape and to see wilderness as part of who we are—to never doubt that the Jack pine, standing noble and steadfast on the shore of some unnamed Lake Algonquin, is a symbol not only of nature, but of our nature. Looking through the visuals on Google’s online Street View collection, it’s hard not to be beguiled and spellbound by the very idea of the North: the vastness, the majesty, the raw, unyielding power of ice and rock and sky. Gazing upon the wide-open, all-encompassing, seemingly infinite space, you get the sense that alongside hockey and maple syrup, this too is our patrimony—the True North, strong and free, now streaming online in stunning, 360-degree high definition.